For the successful launch of the Macan the sports car manufacturer has been awarded the "Marken-Award" 2015. Porsche has been awarded with the intersectoral brand award "Marken-Award 2015" for the successful launch campaign of the Macan. The accolade is awarded by "Absatzwirtschaft", a leading German magazine in the marketing field. This is not the first winner's medal for the four-door sports car that was introduced in 2014. This engineering, production and salesaccomplishment of Porsche already impressed other groups, such as the award committee for the "Golden Steering Wheel" award. The Macan received this prestigious award as the best new automotive product in Europe in 2014. The latest model impresses on both the podium and the road. 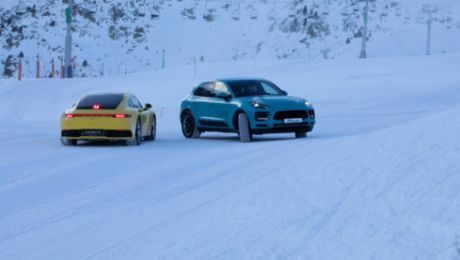 The Macan is already a sales success with 45,000 units sold, and these sales just represent the period from its market launch in April 2014 through December of its introductory year. Porsche AG has announced that production of the SUV will now be ramped up to over 60,000 units annually. The compact Macan is the fifth model series of Porsche AG after the 911, Boxster/Cayman, Cayenne and Panamera and attracts a lot of attention from a new range of customers. "Three-quarters of Macan customers worldwide are first-time buyers of a Porsche brand vehicle," says Dr. Kjell Gruner, Head of Marketing of Porsche AG. This means that the Macan is tapping into a new customer segment. Worth noting: The Macan appeals to a new generation of Porsche drivers – and one that differs from country to country. While the typical Macan customer in Germany and the USA is male, almost one-half of customers in China are women. With an average age of 35, Macan drivers in China are also significantly younger than their western counterparts. The market forecast for the new model by the Stuttgart-based sports car producer is good. Accordingly to various predictions SUVs are by far the fastest growing market segment worldwide. Since the late 1990s the number of new SUV purchases in Germany has grown almost unabated over the past twelve years – with an average growth rate of 13 percent. By 2020, the market share in Germany could rise up to additional 45 percent. In its segment, the Macan S excels with typical roadster design and dynamic specifications as its torque (460 Nm), top speed (254 km/h) and acceleration (5.4 s from 0 to 100 km/h). In addition, buyers can customise their new cars extensively, for example with an air suspension or a high-end surround sound system. Options from Porsche Tequipment and Porsche Exclusive can transform the vehicles visually and technically; these options may be refined at the factory or as aftermarket retrofits. The Macan is available in three versions. "Each one is a sports car, each unmistakable in its segment. And each one is a genuine Porsche – from their design to their driving dynamics and equipment," is how Bernhard Maier, Member of the Executive Board for Sales and Marketing describes the market placement of the premium vehicle. "This applies in particular to the sporty S version, the efficient marathoner with a diesel engine and the Turbo, which sets new performance standards in its vehicle class." 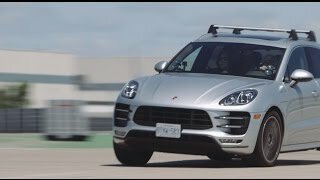 Pushing the Limit: The Macan on the Racetrack.